After spotting a herd of mountain sheep on the previous day, I returned to a similar location in Zion hoping to find the herd again. 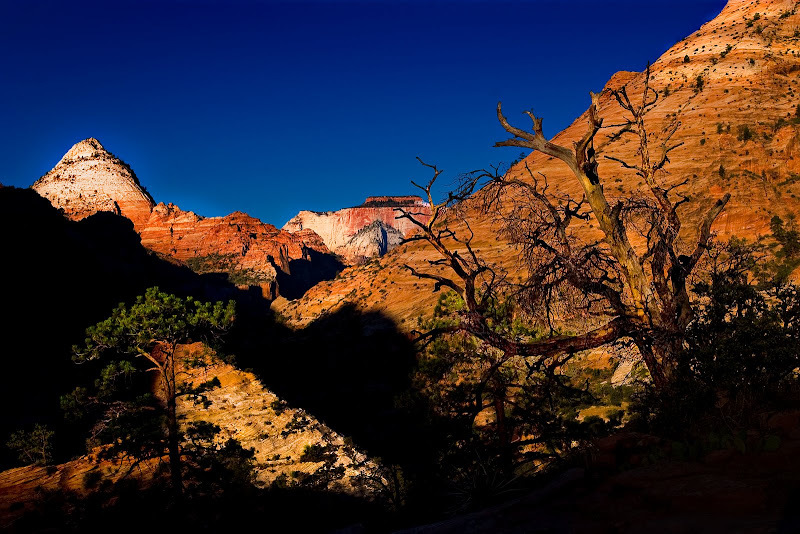 I hiked further up the next side canyon, and did not see any trace of the herd, but I was intrigued by the shadows spread at sunrise across the canyons of Zion. The canyons and Bridge Mountain (top left) emerge from the blackness below. I tried to position myself in a location to get a Ponderosa Pine tree to line-up directly in front of Bridge Mountain, but wasn't able to get in the right spot on this day.